The first time I walked past a Uyghur (wee-grrr) restaurant I did a huge double take at the sight of the brown-haired, fair-skinned green-eyed guy manning the charcoal grill outside. I wondered why this Irishman was so down on his luck that he was working the grill in a Shanghai hole-in-the-wall, but actually I had just seen my first Uyghur. The Uyghurs live in the far, far west of China, in a place called Xinjiang ('the new frontier') and have a history so complex and turbulent that I couldn't summarize it in less than eight volumes. Suffice to say that it borders with China, Kazakhstan, Kyrgyzstan, Pakistan, India, Afghanistan, Russia, Mongolia and Tajikistan, and pretty much all of those countries, and especially China, have wanted pieces of it at on time or another. It's currently labelled as The Xinjiang Uyghur Autonomous Region of The People's Republic of China, but it is nothing like the rest of the country. The people look different, speak a different language, and follow Islam. Xinjiang does have something in common with the rest of China though - in the same way that the Cantonese have colonised the rest of the world with restaurants serving the same rota of sweet and sour pork, mongolian lamb, sichuan beef and fried rice, so too the Uygurs have colonised the all of China with their restaurants. Practically every street in Shanghai has a brightly coloured Uyghur restauarant with a charcoal grill facing the street and staffed entirely by men in embroidered vests and small white caps. 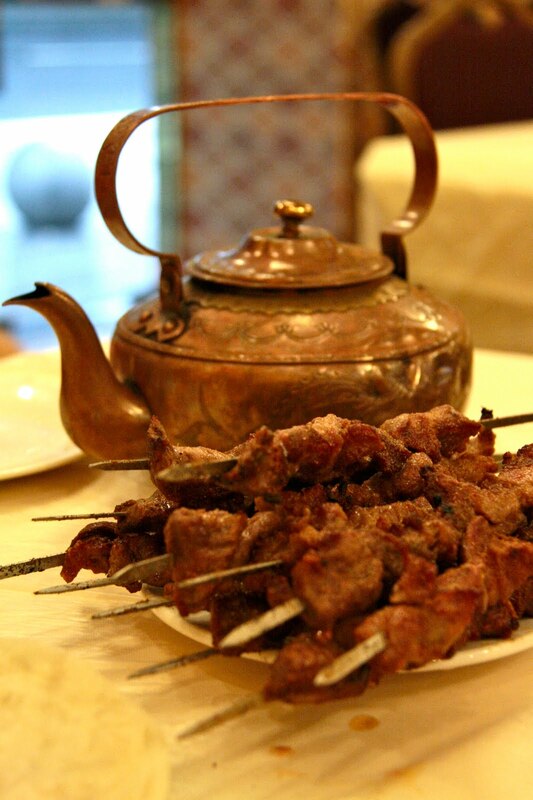 The food is simple and based on mutton and lamb, and various breads. It's hard to go past the kebabs - chunks of tender lamb on long, wooden-handled metal skewers, sprinkled with salt, pepper, cumin and chilli mixture and grilled over charcoal. Smoky, savoury, and delicious. We also tried the samsas - small meat-filled bread parcels cooked in a charcoal oven until crispy on the outside, and Uyghur potatoes -potato discs doused in a spiced flour mixture the deep-fried. 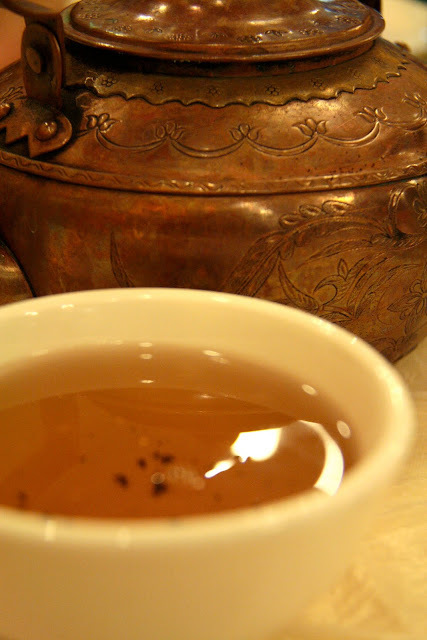 The meal always comes with flatbreads (nang) and tea, not green but black tea, served in an old battered copper pot, and poured into thick white bowls to drink. I watch the Uyghur men. Their restaurants are full of camaraderie and laughter, with a lot of good-natured fooling around. In the evenings there is often music, dancing, and more banter. Looking at them, it seems hard to believe the dire warnings of the Chinese government about the political situation in Xinjiang, and the 'Uyghur threat'. I look forward to visiting someday. I know the food will be worth the trip.